#NoMoreBlues: Sonam Kapoor & Anand Ahuja Are Winning At Twinning! Looks like the 'It' couple of Bollywood is sporting a monsoon theme today. Sonam Kapoor and Anand Ahuja wore two shades of a monsoon sky today at the store launch of Bhane and Pure VegNonVeg in Mumbai and it has driven away all our blues. The whole Kapoor khandaan is there in Anand's support and so are their serious #FashionGoals! 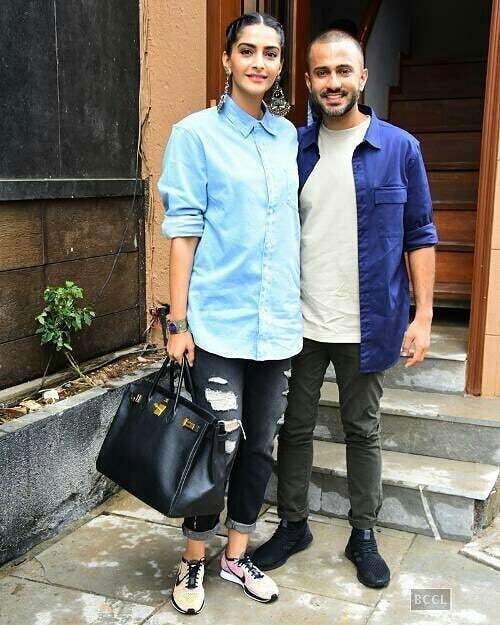 Shirts - blue, jeans - black, shoes - sneakers and faces lit up, Sonam and Anand sure no how to beat #MondayBlues stylishly. While Sonam Kapoor has worn her blue shirt all buttoned-up and crisp, Anand went for a more casual look by pairing his blue shirt like a jacket with a basic white t-shirt. If we get down to the details, both their shirts have a pocket on the left. Call us a romantic but even the cuffs of their sleeves and jeans are similarly folded, ugh! Also, we're totally loving the desi touch Sonam has added to her OOTD by accessorising with drop earring and a statement cuff. Of course, there is a Birkin to complete the look. The sneakerhead Anand Ahuja's two brands - Bhane and Pure VegNonVeg - are coming together at this store in Bandra. From the launch event earlier today, we found this video of Anand being a good salesman and helping Sonam try on the shoes for fitting. If only they all were this cute! The Ahujas are setting #CoupleGoals, don't you think?